Elegant side tables, each with a single drawer, paneled in alternating gold and cream glass with brass trim and brass twisted handles. Tapered brass legs. Measures: 60 cm high x 57 cm wide x 31 cm deep (34cm including handle). 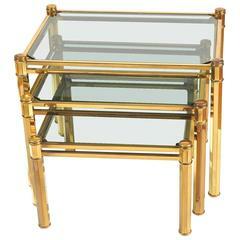 Rectangular nest of three Italian brass side tables. Each table inset with smoky glass with mirrored surround. Chic umbrella stand in smoked glass with brass base, frame and handle. Removable brass drip tray. This gorgeous and elegant side table features a green marble top and a brass frame. Manufactured in France in the 1960s. A beautiful side table in classic style in good condition. Pair of 1960s glass and brass side tables. Scratches in glass. Pair of 1960s brass lamp tables. Pair of useful brass lamp or side tables. Brass spindles. With smoked glass top with lower open shelf. Pair of 1960s bedside tables, sculpted handles, compass feet chrome metal finish and 2 drawers with one bigger opening with flap. All in excellent condition.